In Australia’s wind farm capital, South Australia the terms ‘chaos’ and ‘crisis’ are used to describe the aftermath of an energy policy ‘designed’ on desktops by dimwits, who haven’t got the faintest clue about how power generation works (or much else, for that matter). There is, above all, one salient feature that emerges across the board. Sanity and rationalism have been cast aside, and the whole arena is now a political and ideological battleground whose main protagonists understand little or nothing about the industry they seek to bend to suit their ideological (and possibly commercial) needs. Rational scientific analysis shows conclusively that renewable energy cannot ever deliver on the very basis that it has been sold to the public. It’s not cheap, it’s anything but free, it’s not environmentally desirable, it offers no energy security, and it cannot exist in isolation from other technologies that are either even more costly than it itself is or have grave risks associated with them. What we find when we analyse the intermittency problem, is that intermittent non-dispatchable power actually carries very little value at all. What society requires, is dispatchable power – power that can be on tap when it’s required, and turned off when it’s not, and it requires in addition a large component of cheap baseload power, that never needs to be turned off. What it does not require is wilful power that’s here today and gone tomorrow. And it’s the erratic delivery of ludicrously expensive wind power ($110 per MWh versus $40 per MWh for the reliable stuff) – and the insane cost of paying operators of highly inefficient Open Cycle Gas Turbines that their owners refuse to fire up until the spot price rockets to over $2,000 per MWh, when the wind drops – that has journos using ‘chaos’ to describe SA’s power market and ‘crisis’ to describe the economic aftermath meted out on struggling business, like Nyrstar’s Port Pirie Smelter. The thing that kills the wind industry is the cost of attempting to integrate a wholly weather dependent power source (abandoned in the 19th Century, for obvious reasons) into a modern power system – where that cost, as it manifests in ever-rocketing power prices, simply can’t be hidden from the voting public. Here’s another take on the South Australian wind power debacle from Richard Blandy (Adjunct Professor of Economics in the School of Management at the University of South Australia Business School) who – unlike the hacks at Adelaide’s The Advertiser – has a very solid head for numbers, due his background in that dismal science. 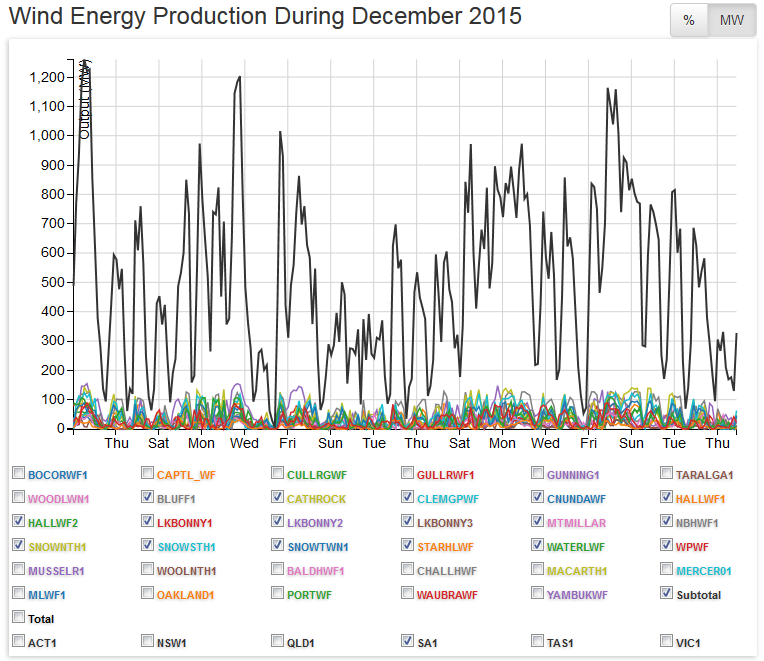 Oh, and to help illustrate Richard’s piece we’ve added a few pics courtesy of the boys over at Aneroid Energy – showing the output from SA’s 17 wind farms (with a notional capacity of 1,477MW) on the occasions referred to. South Australia has set its energy sights on a renewable future but, asks Richard Blandy, at what cost? 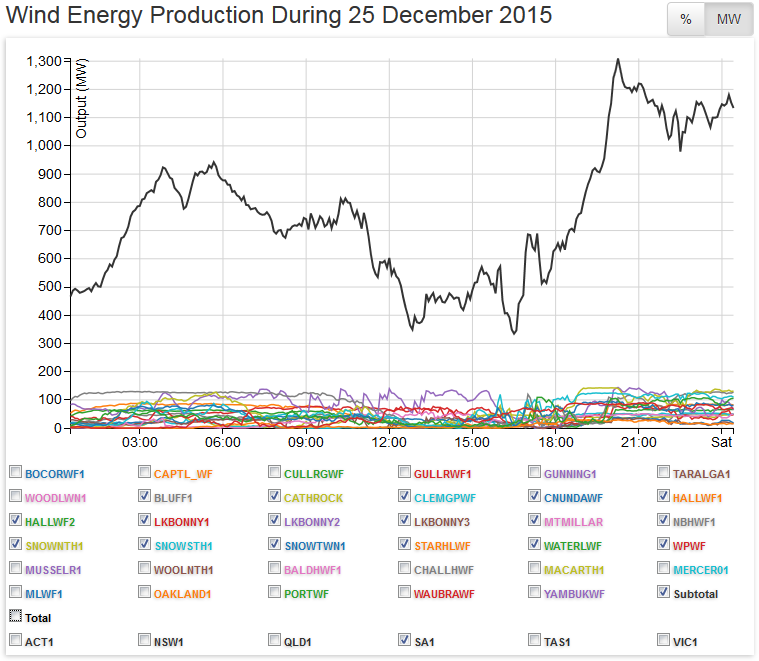 On Christmas Day, according to the average price tables published by the Australian Energy Market Operator (AEMO), the Regional Reference Price (average spot price) for a megawatt hour of electricity in South Australia was $91.67. The corresponding prices in New South Wales, Victoria and Queensland were $37.33, $20.38 and $36.20. The average daily spot price for a megawatt hour of electricity in December 2015 was $62.19 in South Australia, $43.37 in New South Wales, $46.84 in Victoria and $42.08 in Queensland. On December 17, the average spot price for a megawatt hour of electricity in South Australia was $259.59, while on December 26 it was only $5.06. 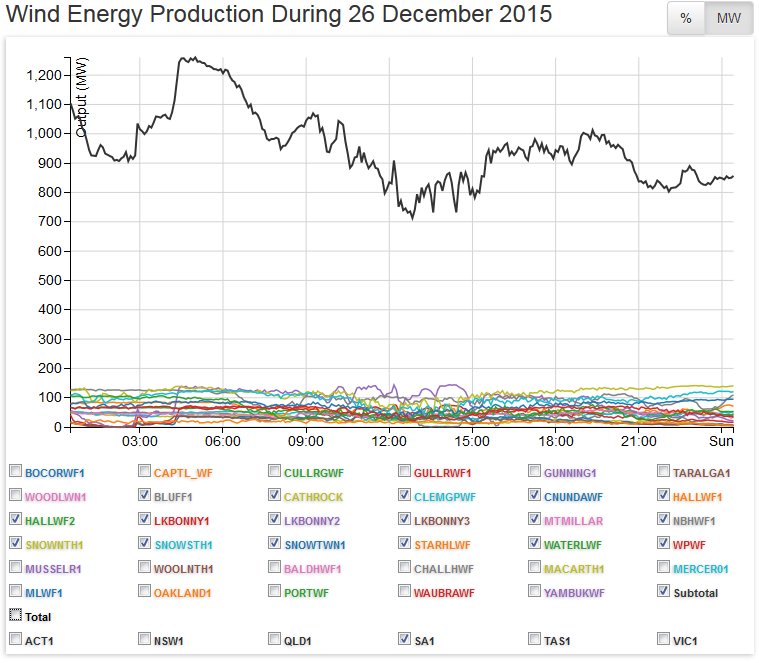 It is clear that South Australia has the most expensive and most variable power on the eastern states grid. The reason for the high (and extremely variable) price of electricity in South Australia is our very high dependence on solar and wind generation compared with the other states. 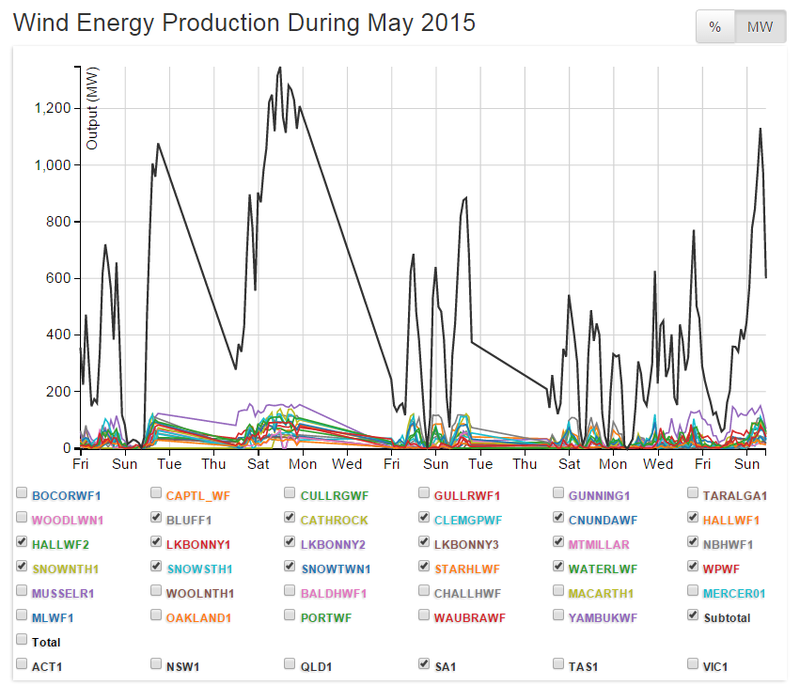 This results from the rapid expansion of renewable energy generation in South Australia. According to a Deloitte Access Economics study recently released by the Energy Supply Association of Australia, South Australia’s solar and wind generation capacity per head of population is already more than three times that of any other state or territory. A new Climate Change Strategy for South Australia was released by Premier Jay Weatherill and Minister for Climate Change, Ian Hunter, on November 29. The strategy was conveniently (if implausibly) rebadged as an economic development initiative. In it they said to realise the benefits, we need to be bold. That is why we have said that by 2050 our state will have net zero emissions. We want to send a clear signal to businesses around the world: if you want to innovate, if you want to perfect low carbon technologies necessary to halt global warming – come to South Australia. 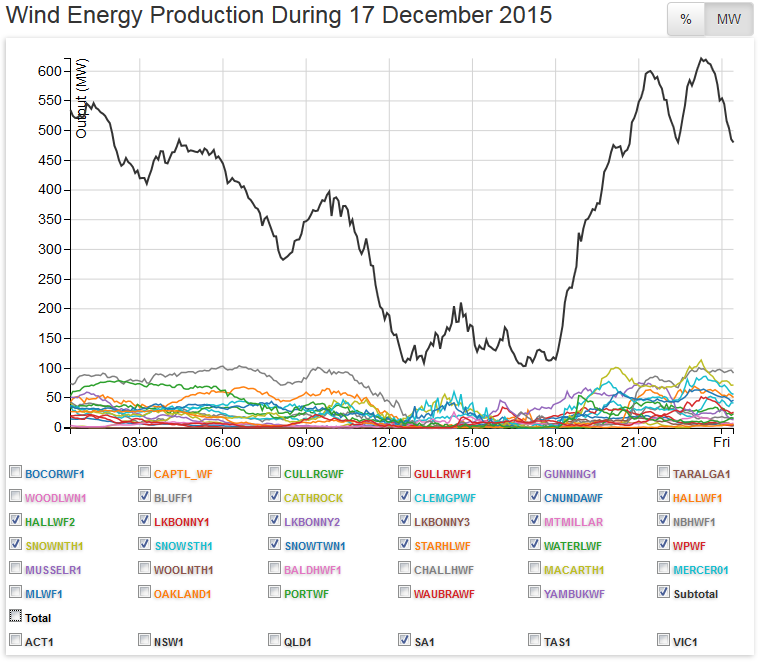 South Australia can be a low carbon electricity powerhouse. We have the ability to produce almost all of our energy from clean and renewable sources and export this energy to the rest of Australia. But people want electricity to be available when they want it, and for it to stay on, with a steady current, while they want it – not just when the wind is blowing or the sun is shining. The trouble with solar and wind generation is that it only generates electricity intermittently. Covering this intermittency is expensive in terms of idling standby plant. Generators with the required flexibility (peaking generators using natural gas) produce expensive electricity, but are becoming more and more needed as the penetration of wind and solar in our energy generation mix increases. This is why electricity prices have risen in South Australia. Wind farms and other renewable-energy generators also undercut the prices offered by efficient, base-load, coal and gas power plants, because they receive guaranteed, non-market, returns from selling Generation Certificates to electricity retailers under the Commonwealth Government’s Renewable Energy Target (RET) Scheme. Under RET, electricity retailers must buy enough certificates to demonstrate their compliance with the RET scheme’s ever-increasing annual targets. The revenue earned by each wind farm from the sale of certificates is additional to the revenue received, if any, from its sale of electricity to the electricity market. The yearly RET targets imply significant annual investment in wind farms, while the sale of certificates to retailers is designed to guarantee a return to wind farms sufficient to justify the required investment, irrespective of the return they receive from actually selling electricity to the market. Well done, wind farm lobby. If sales of electricity are growing only slowly (as they are in South Australia’s slow-growing economy), the subsidised market share of wind farms and other renewables will rise and the sale of electricity from conventional base-load power plants will fall. At some point the coal and gas-fired conventional power plants will become unable to contribute towards their fixed costs, and they will go out of business. This is what has happened in South Australia. But this is the whole point of renewables in climate change terms – to knock off CO2-producing coal and gas-fired power plants, thereby helping to save the planet from climate change. The Port Augusta power station is closing because of Commonwealth and South Australian Government policy to expand renewable energy generation. This is not an accident. To save the planet, it was always intended to have this effect, but maybe not next year. Leigh Creek is shutting down as an unintended consequence. Pelican Point has been mothballed and Torrens Island is also slated for closure. If the demand for electricity is low – on a public holiday, say – while the wind is blowing and the sun is shining, the price of electricity in South Australia will be low. Conventional generators will make losses, while the market losses of the renewable generators will be covered by their sale of Generation Certificates. If the demand for electricity is high – a heat wave on a working day, say – and it is a still, overcast day, the price of electricity in South Australia will be high, because it will be mostly produced by high-cost, back-up, peaking generators. The high cost of maintaining back-up generation capacity (sufficient, essentially, to duplicate the generation capacity of the renewables) means that the average price of electricity produced in a system dominated by renewables will always be expensive without strong interconnection, such as in Denmark, to large, inexpensive, electricity-producing regions nearby, that produce most of their electricity from coal, gas or nuclear sources. We are not in that fortunate position. According to Deloitte, South Australia’s interconnectors with Victoria are able to supply only 23 per cent of South Australia’s peak demand (although their capacity is presently being increased). 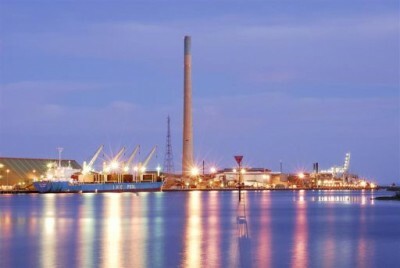 According to a report in the Australian Financial Review in December, South Australian Treasurer and Energy Minister Tom Koutsantonis called a meeting of energy users and suppliers to deal with the sharp rises and falls in wholesale electricity prices that, in particular, threaten the economics of the lead and zinc smelter at Port Pirie operated by Dutch company, Nyrstar. South Australian businesses face electricity prices in 2016-18 of between $87 and $90 per megawatt hour, compared with $37-$41 in Victoria and $43-$48 in New South Wales. South Australian irrigators are said to be facing electricity price increases of more than 100 per cent next year. According to the AFR, forward electricity prices in South Australia are far higher than when Nyrstar signed up in May. Further, the threat of disruption of supplies if the inter-connectors to Victoria fail, or become inadequate to meet the demand for electricity in South Australia on peak days, are of understandable concern to the company. Nyrstar is scheduled to start operations in mid-2016. Options for the Government to stop Nyrstar quitting all look expensive. In the short run, the Government’s main option could be to cover the extra anticipated cost of electricity and the cost of any supply disruptions with a further subsidy to Nyrstar over and above the $291 million it has already promised. This subsidy could be substantial. In the long run, the Government’s main option could be to pay for even more interconnection to Victorian, New South Wales or Queensland coal or gas-powered electricity generators. It will have to do so to protect the stability of the electricity grid in South Australia soon, anyway, as well as to put a cap on wholesale prices (the price of base load electricity interstate plus the cost of shipping it here through an interconnector). This will also be costly. The high price of electricity in South Australia is eating away at our economic competitiveness. The probability that we will become, sometime in the distant future, a “low carbon electricity powerhouse” looks extremely low. As often happens with Government initiatives in South Australia, significant Government subsidies are likely to be offered to appropriate companies to locate here, so that the Government’s aspirations appear to be vindicated. Richard Blandy is an Adjunct Professor of Economics in the Business School at the University of South Australia. ← Wind Pushers Losing Popularity!